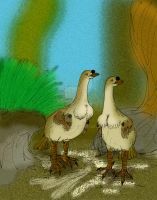 The last of a series of paintings I did of Mesozoic birds displayed as if they were dead and stuffed (19th century naturalist style). I had fun with the series---maybe I'll try it again when I get my canvas and paints and scanner and whatnot to my new home. Anyway, this one is my favorite of the series, as well as the last. Confuciusornis dui, with a cute little upturned beak tip that makes this species so much more attractive than boring old Confuciusornis sanctus. I've been out of touch for a while, though, have all the C. species been merged or what? Beautiful! Yes, I'd love to see you continue this series. Thank you. Actually, that might be a good way to approach the next picture I'm planning. Thanks for the idea! Really nice work, love the white spots on the primaries. Thanks. I don't think those come from any real model bird. But I may be wrong. 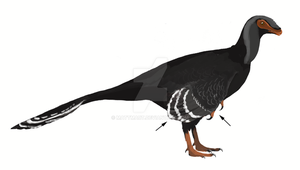 There actually has been a color study done for Confuciousornis which seemed to recover large numbers of eumelanosomes and pheomelanosomes, which would have given the critter hues of grey, white and brown in life. [link] These color studies that have been popping up are both the most awesome and most frustrating things - I've had to redo several of my illustrations prior to publication because of them. Ug. I know what you mean. I like this picture, but maybe it's time to do another one. C. dui's an old favorite of mine, I like the colors you used, and the whole style is great. like a still-life of a real display. Yes. Those were fun paintings to do. Great work! Love how you have the laid out all Audubon-style I used to work in a vertebrate museum collection, looks a lot like the plates they have hung on the walls. Cool-sounding job you had there. Yes, I was going for a sort of naturalist-finds-dinosaurs-and-draws-them feel. But the particular inspiration was C.F. Tunnicliffe, who was 19th century, and who has a great book floating around written about him. thanks---I've always been a little timid about silhouettes and and sharp color gradients, so this painting was a stretch in some ways. This is gorgeous. Whe nI saw the thumbnail I was going to tell you how impressed I was that you made it look like a study skin. Then I read the description, so I'm goingto say, I think you pulled it off quite well! I can only really comment on this artistically, not being much for biology or its ilk myself, but the colour, texture, and attention to detail in this picture are spectacular. I'm especially drawn to the careful work on the feet and wing-claws. A beautiful piece of work! Thanks a lot. Wow, all this praise for the dead birds makes me want to do more of them. I don't have any paints at the moment, but maybe I'll play around with my tablet and see if I can't put something presentable together. Well, really you should just draw more, period. I think it's the colour and the detail that people are responding to more than the dead birds themselves. Thanks. I've been working on something, and it should be done in the next couple of days. I've just started my new job and I'm still working out how to manage my time most efficiently, but I am trying to be more productive than I was in college. Hmm...very good! I really like it! I like to see old stuffed specimens from museums, it make me back in time, when most of the birds had not scientific names and need to be found. That's what I'm aiming for. I've always found natural history more fun than biology. I always enjoyed your "museum-style" paleo-bird pics, your Confuciusornis were the most striking, but I have fond memories of your Yanornis also. Thanks. I like this style too and I think I might get back into it. And maybe I'll upload Yanorinis next. there was also a pterosaur or two, as I remember?